Experience the thrill of flying and soar through the history of flight, from the Wright brothers to the dramatic high speed aerobatics of the world-renowned Blue Angels. Enjoy acrobatic aerial sequences from the view of the death-defying pilots, as they circle the air in an orchestra of fast flying machines. 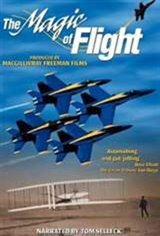 This film also educates the viewer on the science of flight and what makes these marvellous machines actually get up in the air!